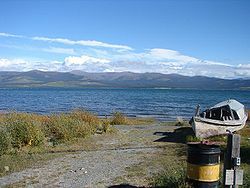 Burwash Landing is a small community, at historical mile 1093 on the Alaska Highway, in Yukon, Canada along the southern shore of Kluane Lake. The present location of Burwash Landing was first used as a summer camp by the Southern Tutchone Athabascans until a trading post was built in the early 1900s by the Jacquot brothers. At the 2011 census, the population was 95, an increase of 30.1% over the 2006 census. The majority of the population are Aboriginal peoples, First Nations. 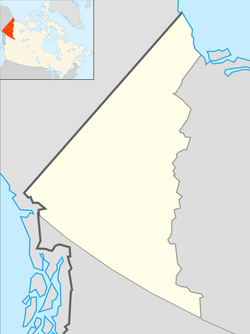 The community is the administrative centre of the Kluane First Nation. In addition to the Alaska Highway, the community is served by the Burwash Airport. It is the home of the Kluane Museum of Natural History and the Kluane First Nation, and also home to the world's largest gold pan. In July 1937, Robert Bates and Bradford Washburn, two members of the Harvard Mountaineering Club, made their way into Burwash Landing after climbing the 17,146 ft (5,226 m) Lucania peak and hiking over 150 mi (240 km) across the wilderness after their bush pilot was unable to retrieve them. Burwash Landing is 2,647 ft (807 m) above sea level at the airport. The elevation can be higher in some places and lower in the others. Burwash Landing is located on the Historic Milepost 1093 Alaska (Alcan) Highway. It sits on the northwest shore of Kluane Lake. Several prominent geographic features have been renamed in Southern Tutchone language. Burwash landing is the traditional home of the Southern Tutchone Athabascans. It used to be a summer camp. A revival of the Southern Tutchone language and culture has been taking place in this quiet lakeside community. This is readily apparent to visitors when they pull into town and are met with Southern Tutchone street and traffic signs, within and nearby Burwash Landing. Several prominent geographic features have been renamed in Southern Tutchone and signs can be seen along the Alaska (Alcan) Highway. Burwash Landing is known for its black spruce burls. Burls start as an irritation in the spruce. The tree sends extra sap as healant, which creates a growth (burl). Burls are either "green," harvested from live trees in the spring, or they are "dry burls," taken from dead burl trees.Burls are peeled off their bark and used in their natural form as fenceposts, for example, or they may be shaped and finished into a variety of objects, such as bowls. Check the Burlbilly Hill on the Milepost 1061.6, the visitor will see rows of "burly logs" on the hill. ^ 'Anchorage Daily News. "Climber's exploits earned little recognition" by Craig Medred. October 7, 2007. ^ "Burwash A" (CSV (2874 KB)). Canadian Climate Normals 1981–2010. Environment Canada. Climate ID: 2100182. Retrieved 2014-02-20. Wikimedia Commons has media related to Burwash Landing, Yukon. This page was last modified on 22 April 2016, at 09:42.